Three Spanish friends joined me in Moorea for a few days of vacation. All excellent divers, I asked François (TOPDIVE Moorea center manager) to organize a beautiful dive for us for the occasion. 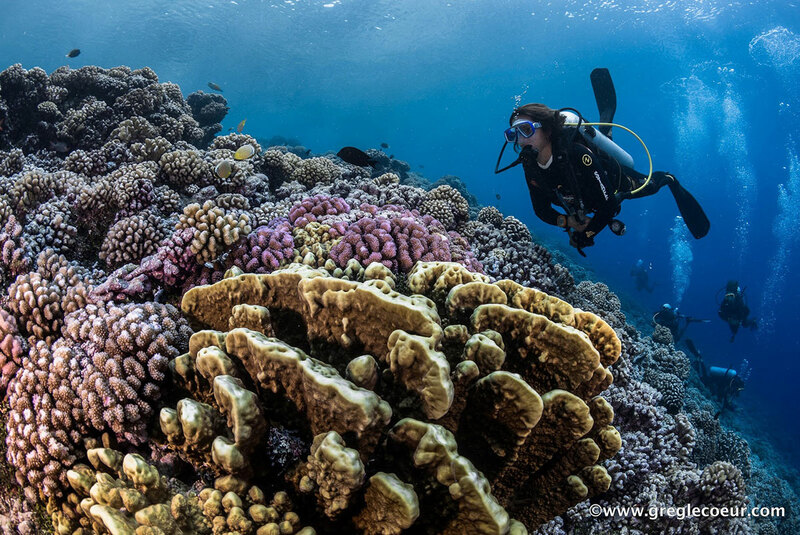 Quite naturally, he proposed for us to discover the « TIKI » dive site well known to be a thrilling dive. 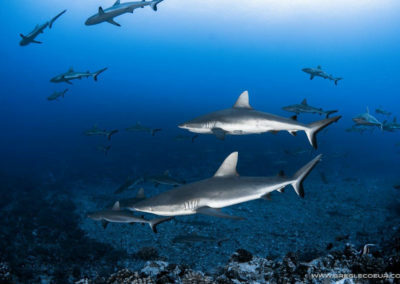 A dive site known for its importantconcentration of grey sharks it takes its name from a “Tiki” (a small Polynesian stone statue) submerged in the lagoon. The numerous sharks used to swim around this statue. 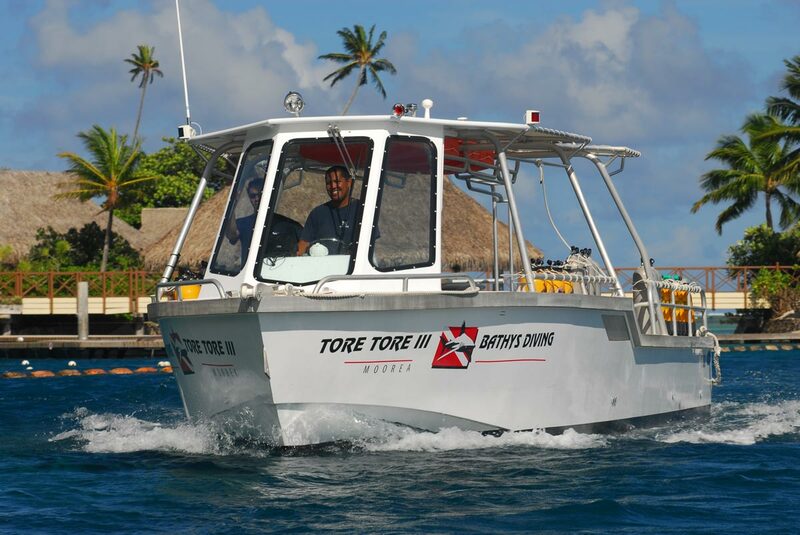 The Tiki dive site is located 10 minutes away by boat from the pass and close to the oceanic slope. 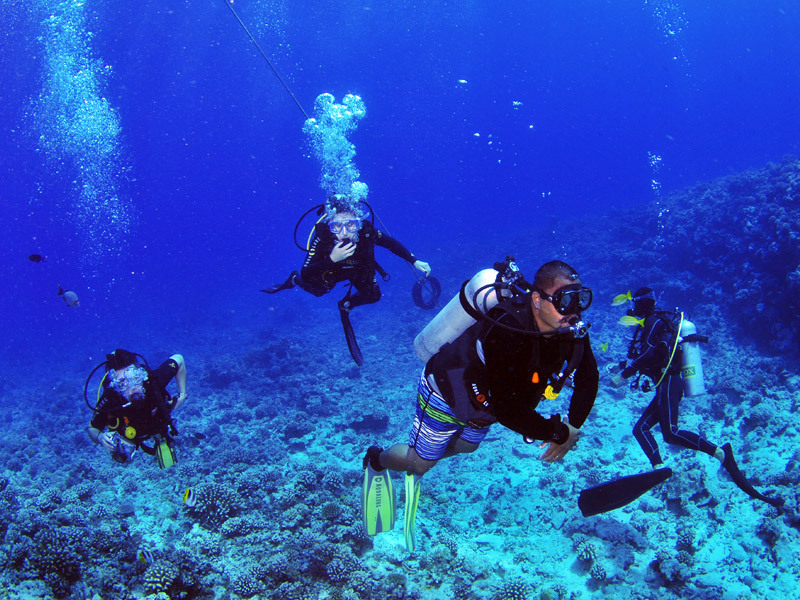 The dive is carried out at a medium depth of 82ft, no deeper than 115ft deep. 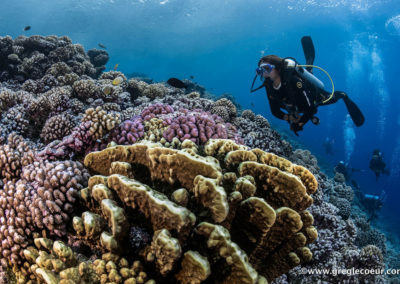 Visibility is usually excellent and the divers used to a slow moving current. 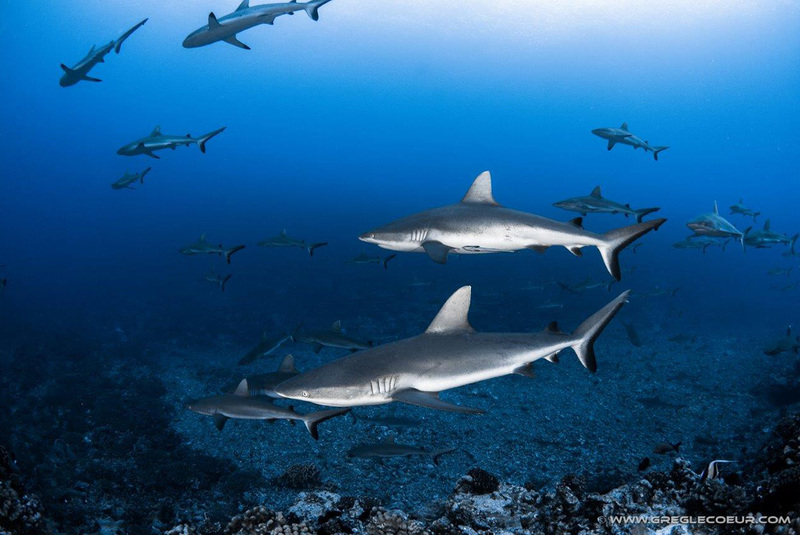 Our group of 4 divers submerged with the aim of discovering the Grey reef sharks of Moorea. 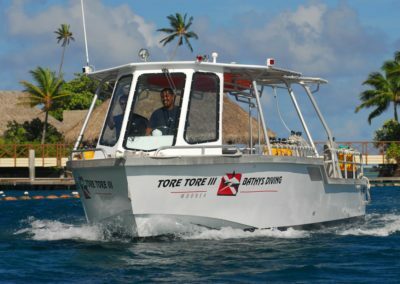 Emilio, Pilar and Miguel’s expectations of the site were not disappointing; there were a dozen of sharks swimming around the TIKI with the usual fauna of the coral reef. After one 30 minutes of shark observation, we finally decided to explore the surrounding area. So, we followed to the drop off. 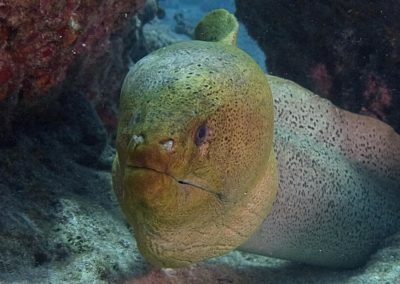 As we progressed, we discovered a coral massive hosting a beautiful moray eel. Our dive group admired it with caution. Just as Emilio was moving away from moray’s hole, we noticed a gigantic shadow passing over us. He alerted us with large arm movements. 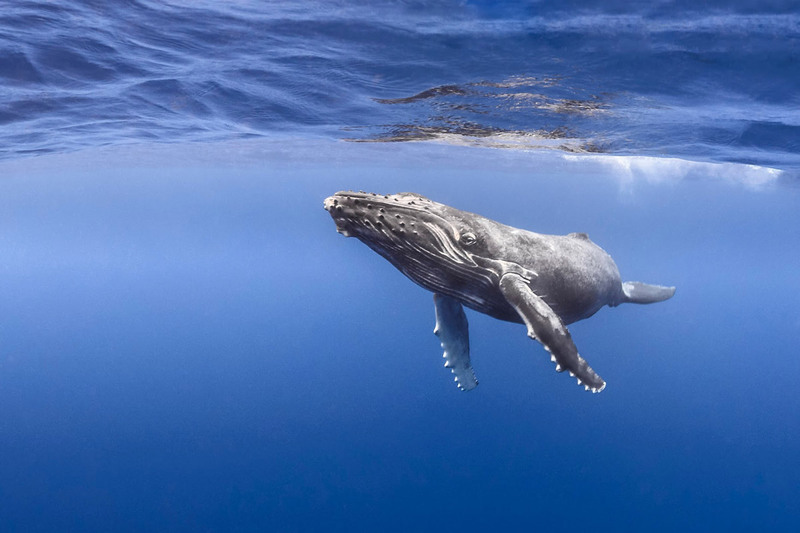 First we were all a bit startled but more amazed after identifying that the shadow was that of a young humpback whale. The encounter was magical and left us all speechless. The small whale took some time to notice our presence. Its natural curiosity brought it to circle around our diving group at about 32ft. We were all in awe and we remained motionless as not to perturb the wonder of the moment as well as frighten the young one. After some incredible minutes of intense whale watching, the whale left as silently as it had come. Remis de nos émotions, il faut maintenant songer à revenir au bateau car certains sont désormais proches des 50 bars. Nous entamons notre remontée, mais notre rencontre n’est pas véritablement terminée. Le baleineau, qui n’avait apparemment pas fait le tour de sa découverte, est revenu nous voir pour un dernier salut avant de finalement disparaître vers le large. Par chance, l’un d’entre nous avait un petit appareil photo sous-marin pour immortaliser la plongée et cette scène ne lui a pas échappé. Nous pouvons donc revivre ces moments magiques grâce à ses superbes clichés. A wave of emotion swept over us and we thus realized that it was already time to surface; two in our party were already low on air. As we were joining the boat, the “baby” whale circled back to see us; a parting last look before disappearing in the deep blue. Luckily, one of my friends had brought a small underwater camera to immortalize this breathtaking dive. We often relive these magical moments thanks to his great shots.